Lead a Hackaday Meetup in your city on April 22nd. This event was created on 03/31/2017 and last updated 2 years ago. 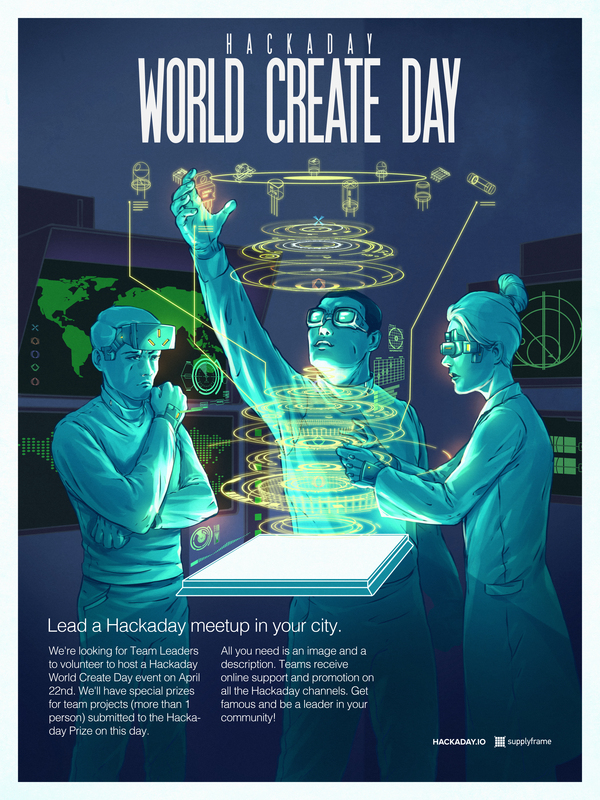 Lead a Hackaday Meetup in your city, village, garage or yard! There is a strong community of local Hackaday meetups around the world - let&apos;s add yours ! Fill out this form to let us know that you’re interested in leading. What is World Create Day? World Create Day lays down a design challenge. The people at your meetup will pick a challenge and brainstorm a solution for it. Use the skills of everyone involved to come up with mechanical, electrical, and design solutions. We want to see pictures of which interesting ideas sprouted from your group. The best design solutions will be shared on Hackaday.com and all of our social media platforms. Celebrate the fun of getting together in person with all of the people who make Hackaday a part of their daily ritual! This is the official poster for World Create Day. Please download freely! Sounds cool. What kind of swag will event hosts receive? Hackaday Stickers, World Create Day stickers, and possibly some t-shirts. is there a lot to it? It was a request, but now it is an exclamation. Sadly, nothing of any technical consequence has been going on in Alabama since the late 80&apos;s, with the exception of a few SMALL hamfests. We&apos;ve got an event at the Supplyframe DesignLab in Pasadena (Los Angeles), but we need more in the greater LA region! Anyone looking to host an event in Orange County, the Westside, San Bernardino? We need more events to black out the map in Greater Los Angeles! Let&apos;s do it! Who&apos;s doing Boston MA or Worcester MA ? @Kevin Harrington ? You want to help me organize a Technocopia Meetup? Anyone Wales or west of England? You are about to report the project "World Create Day 2017", please tell us the reason.